THERE were a couple of obvious initial signs that Paddy Quinn hadn’t come the same route as the other 54 players who were asked out in Jim Gavin’s first provisional Dublin panel in October 2012. At that early morning session, he noticed Declan O’Mahony wearing an old London jersey. Upon closer inspection, Quinn found it to be the one he had worn playing for London against Dublin eight years earlier in a qualifier in Parnell Park. Afterwards, as Quinn suited up to begin his working day as a chartered accountant, he spotted Naomh Mearnóg’s Shane Carthy neatly putting on his own tie, the final element of his secondary school uniform. At the time, Quinn was 31. He had never played inter-county football at any level underage. And he was from Tyrone. 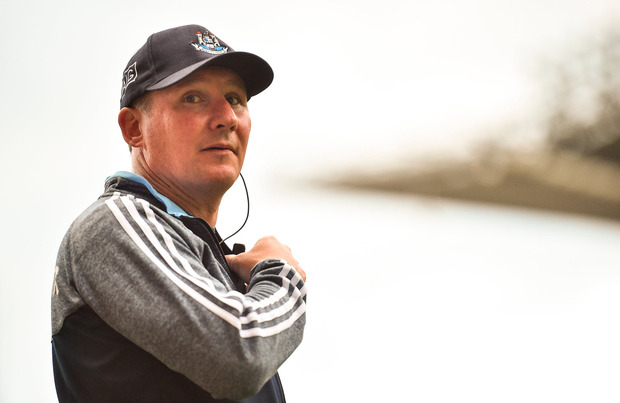 "I remember him speaking the first day at the first meeting," Quinn recalls now of Gavin’s initial address to the 55-man squad who had been promised nothing more substantial than a chance by the new Dublin manager. "He told us that his aim was to win three All-Irelands in the next three years. "He had the goal set out and he had it planned out to a tee how that was going to happen." Quinn had been with Na Fianna for five years at that stage, untouched by inter-county call-up in either Dublin or Tyrone. A native of Derrylaughan, an intermediate club when Quinn left them in 2009, (and whom he rejoined last year) he was a late developer physically and with Tyrone in their All-Ireland SFC winning pomp, he had never registered on Mickey Harte’s radar. Then, having spent a couple of years commuting from Dublin, where he worked, Quinn joined Na Fianna in 2009, through a friend of a friend. The club were entering a post glory-era slump. A single Dublin SFC semi-final was as far as he went although his League form was particularly good and other players had suggested he could be in the shakeup under a new manager when Pat Gilroy left in 2012. Still, he didn’t exactly belong to Gavin’s key demographic. And then in October 2012, Mick Kennedy – then part of Gavin’s management team and another Tyrone native – called Quinn. There would be cuts, Gavin explained, at various intervals through the winter and spring until such time as the squad numbered 34. Yet on the occasion of his first League match in charge in Croke Park against Cork on February 2, 2013, the Dublin forward line read: Paul Flynn, Diarmuid Connolly, Paddy Quinn; Bernard Brogan, Paddy Andrews, Paul Mannion. He played against Kerry and Mayo also but looking back, Quinn reckons he “didn’t make the most of the chances. "You look back on it and think 'it was great to be there' but on the other hand you think 'if I’d taken a score' or whatever, you could have ended up with a couple of All-Ireland medals. "And that’s literally what it’s like." "When you’re called up into that setup, you’d do anything to be part of it," he says. "You’d do anything to be part of that set-up just to train, never mind playing any matches." At 31, Quinn knew his window was small. "Because Mannion and Costello, they were all in their first year when I joined. And they were going to be playing for Dublin for the next decade." There have been changes from Gavin’s initial policy, he observes. "Jim’s mantra in those early years was 'man on man'. It was up to defenders to win their own battles," Quinn recalls. "That was their responsibility; to defend. "He wanted Dublin to play the right way. And that’s not to say they’re not playing the right way now. But there was maybe too much of that. "And the Donegal defeat, it forced him to reconsider that absolute attacking philosophy. Donegal exposed that. "But that was one game. Jim has lost one game in five years. It’s unbelievable. "He’s won every League, bar one, and every All-Ireland bar one. After an As versus Bs match in May, Gavin called Quinn to inform him he had fallen victim to the final cut. "When it came to crunch," he says, "he kept on fellas like Emmett Ó Conghaile over me. "It was probably a close enough call. But Emmett had the years on his side." He was called back in during the Leinster SFC when Tomás Brady ruptured his cruciate ligament but Quinn suffered a hamstring injury in a trial match and Ciarán Reddin, who had been part of the same May cull, came back in and won an All-Ireland medal. For all that, Quinn reckons Gavin "doesn’t get the credit he deserves. "The lads that are missing or have gone, they’re not even talked about now. "It’s just next man up. And he always had that ‘next man up’ mentality. And he always had that ethos – everything was for the greater good of the team. "And it’s easy to say that. But it’s a different thing creating that culture. And Jim created that. And you can see the benefits of it. "Having that culture is priceless. And I think that all comes from Jim," he concludes.